The challenge was to rebrand all the vehicles in a short timescale at multiple locations removing existing livery first where already fitted. An additional challenge was to come up with a solution to the requirement that some vehicles were required to display a choice of AVC or their ultimate client, Sky’s branding. 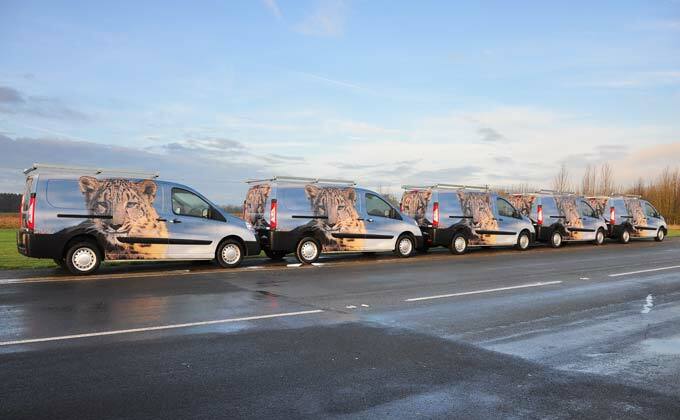 We worked closely with their vehicle suppliers and AVC’s own fleet and regional managers at multiple locations to ensure that the right vehicles were available to be wrapped on an ongoing programme. From our production base in Sussex, we used the latest environmentally-friendly printers and top quality 3M wrapping vinyl to print and produce the wrap material for each batch of vehicles, shipping complete sets of graphics for up to 40 vehicles per week. Our team of experienced fitters then ensured that each vehicle was fitted with identical livery and the associated magnetic panels to complete the set. All vehicles were given tracking codes on discrete reference stickers to enable traceability and easy supply of replacement parts in the future. “PVL have demonstrated a strong commitment to helping us with our branding roll out and have provided outstanding customer care. They’ve shown honesty and integrity in all their dealings and proven to be highly flexible. They have never overcommitted and delivered as promised. We are delighted to be placing further orders with them and look forward to a continued and mutually beneficial relationship going forward,” Jose Whishaw, Operations Director for AVC Group.